This weekend I tackled my biggest project yet: a desk redo! This desk was mine when I was a kid, and my mothers before me. I decided I could use another desk in my room for everything besides crafting because my crafting desk is getting a little cramped. Thus, I drug this baby up from the basement and set to work. 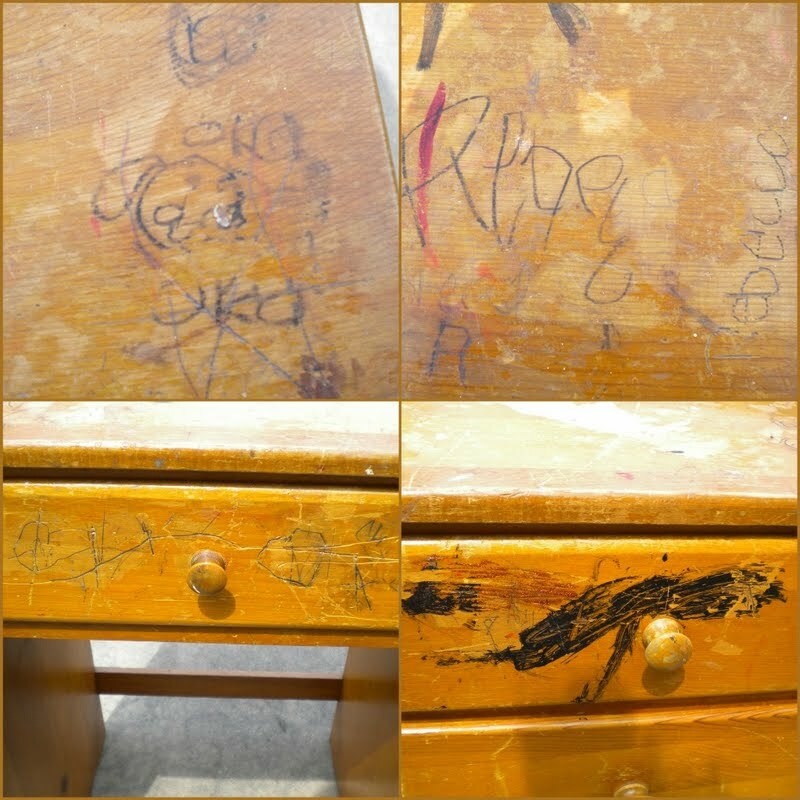 Being my childhood desk, it has some remnants of my past...a drawing of my favorite dog down the street oka, my name carved into the top, coloring on it, a little glitter... seriously 7 year old me what were you thinking?? Seeing that I've never refinished a piece of furniture before, I turned to my dad and asked for a little help. All I wanted to do was sand it down a little, then throw on a coat of paint. Well, when your father used to be a furniture refinisher, I should have known he wouldn't let me off that easy. So, off we went to the workshop of our family piano business and gathered supplies. And I set to work. Here I am about to strip the wood. That orange junk was disgusting. And no, that hairy hand is not mine. Then I used lacquer thinner to use get the rest of the thinner off. No, those hairy hands are not mine either. I promise I refinished the desk, not my father. It was just easier to take a picture of him doing it than me haha. And then painted it pink! I got the paint at a flea market for a dollar. It was a mis-tint. Score for me!! I got some pretty new hardware to put on from Home Depot to make it extra girly. Next project: find a chair to go with it! That looks wonderful! I imagine you had so much fun altering that, I wish I still had my old desk. That turned out great :) Good work! and I LOVE the knobs!! Great job! And thanks for showing all the necessary steps! You are so awesome, Becca! I wish you could come refinish my desk...it was my dad's and is UGLY. You have skillz, my friend. I love it! Especially the extra girly knobs. Wow!! Great job! That looks like a lot of work, but you got a great finished product. fabulous job on your first furniture redo! When I saw the before and after photo.. I was hoping you were going to say you just spray painted the old one and ta-dah! Done! I want to to redo some of our old furniture but the thought of all the stripping and sanding always puts me off. aw- love it! nice job for your first redo. Actually, quite amazing! It's such a soft and beautiful pink, So fun! I love it!! *Sigh* I have no space of my own to craft in...it's the kitchen table for me! Great job on your 1st refinish!! Aren't daddy's great? So cute!! Love the glass knobs. Careful because furniture painting is addictive. Cute desk redo! I just tackled my biggest painted furniture project, too! I linked it up to your blog today. More furniture updates coming soon for me. Much to do! I also love the things you featured in your post today. Having trouble commenting lately so I'm afraid to try to push it with TWO comments. LOL I'm reading, just not able to comment all the time. It looks great! I need to stop procrastinating and paint mine! Adorable! Great to have your dad to guide you, but you did the work and great job! Love a piece that has wonderful memories but looks fresh and clean. Thanks for sharing at Show and Tell. And I "followed" your blog! It turned out beautiful!! TFS! Wow, what a lot of work! But look how beautiful it turned out! Awesome job!! Thank you for linking up! Very nice! That desk sure did need a makeover! You were rough on that thing! lol Thanks for linking it up to this week's Catch a Glimpse party! Beautiful! Love how it came out! I would love if you could link this up to my Delicately Constructed Friday!! Thanks so much! Great job! Beautiful! Love it! This looks good! I have a desk project that looks as bad as your "before" photo, so this gives me encouragement that it CAN become beautiful. WOW, you did an awesome job. looks great for your first redo. Thank you so much for linking up to More The Merrier Monday. I can't wait to see what you come up with next week. Did you do the pink layer with a brush, roller or spray? Adorable! You are very talented! Nice job! You definitely put more work in than I have with painting furniture (I never used the thinner or stripped the wood). Very cool that you also have a piece of furniture with history vs. buying a brand new desk. This was a very creative DIY. I never had any idea how many steps went into refurbishing an old piece of furniture, But this was a great step by step process and it was easy to follow along. If you showed me the two pieces side by side, I never would have guessed that one came from the other. The end result looks fabulous! Choose the furniture that is durable and with a very high quality. Good Post on Home decoration & office decorative items specially with carved Wooden furniture products. Well Written and simply executed to understand everything. Thanks for writing such a good Article writing on this Topic . Really impressed with your ways of article writing with this depth.Furniture specially carved wooden furniture is first need for an interior decoration and home decoration. For home decoration it is always in demand and people enjoy the items with style. I enjoyed a lot while reading this post, Thank you for sharing this post. People can know that how can we reuse a damage table after some repair.